Posted by Derek Hughes on 29th September 2018. 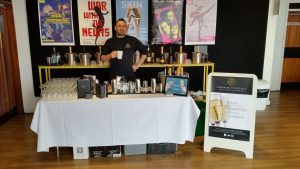 We were delighted to be asked by Nathan to take part in Theatre Clwyd’s first Gin and Prosecco Festival. Theatre Clwyd is based in Mold, North Wales and is a very popular venue hosting many varied events. But this was a “first” for Theatr Clwyd as they had never held an event like this before and it was great to be involved. 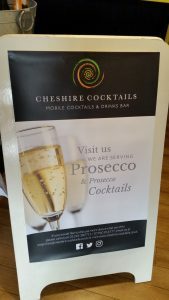 We provided a “pop up” Prosecco bar serving several different types of Prosecco and Prosecco Cocktails e.g. Kir Royale, Bellini and a Brandy based Prosecco Cocktail. The Brandy based Cocktail was definitely the most popular but all went down very well with the guests and we were pleased to be kept busy and enjoyed the sociable fun atmosphere! 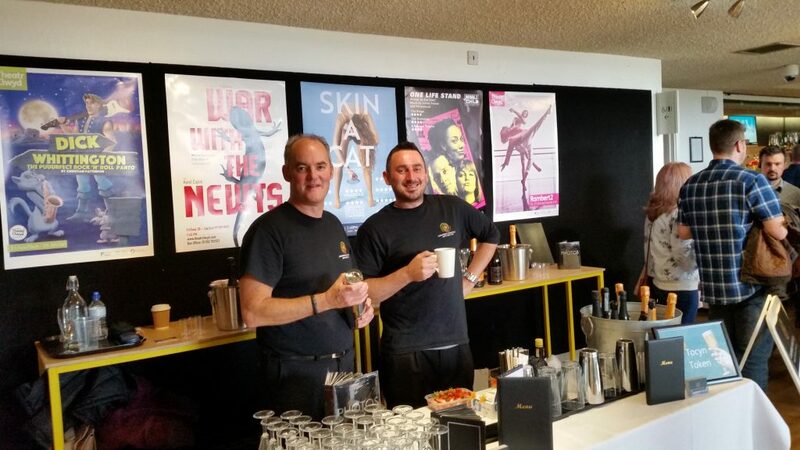 We were working upstairs in the venue alongside the theatre’s own bar area which was packed with many gin suppliers and food supplied by a local restaurant. Unfortunately on the day the weather was not kind as it rained heavily in the afternoon but the atmosphere remained very sunny. Luckily, we just managed to move everything and set up before the heavens opened! We were the only dedicated Prosecco bar there along with other “pop up” locally brewed gin bars from North and Mid Wales and another “pop up” bar serving sparkling wines and artisan wines. The event was a great success, as the room was packed out with a capacity of 250 people, once everyone had arrived. The event lasted 4 hours and the time just flew by! Afterwards packing up was not so much fun in the rain! What is your favourite Prosecco to drink at this Autumn time of year? We would love to see you at one of our events in the future or maybe have us at your own party or celebration, we can adapt to suit all requirements and budgets. Lets Mix it Up! Derek and the Team. James having a brew, before we started! Our advertising board for the event!